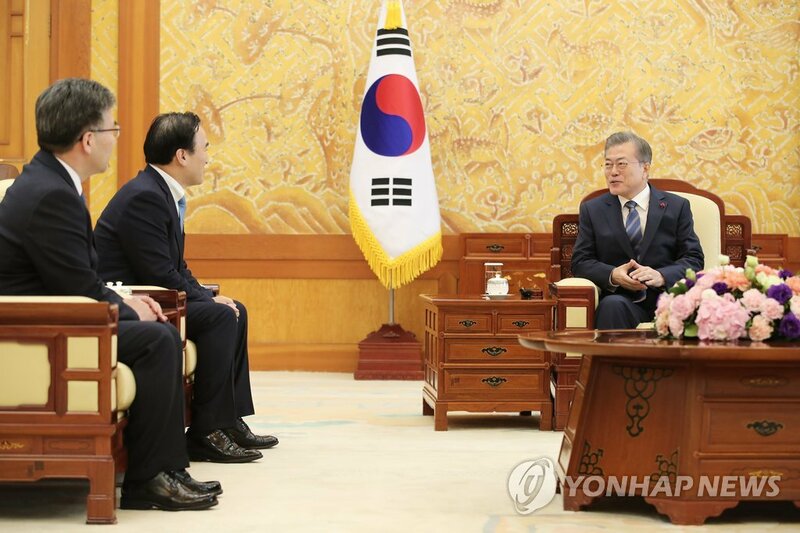 SEOUL, Dec. 19 (Yonhap) -- President Moon Jae-in on Wednesday welcomed the recent election of a South Korean as the new head of Interpol, calling it a victory for the entire nation. "I sincerely congratulate and welcome your election as (Interpol) president," Moon said while meeting Kim Jong-yang, the newly elected head of Interpol, formerly the International Criminal Police Organization. "I understand Interpol is the largest international organization with 194 member countries, bigger than the United Nations in terms of the number of member countries. You are a great source of pride for our nation since you were also elected by a large margin," the president said in the meeting held at his office Cheong Wa Dae. Kim, 57, was elected the new head of Interpol last month, replacing Meng Hongwei of China, who disappeared three months ago. The South Korean is set to serve the remaining two years of Meng's original four-year term. President Moon called for joint efforts to fight international crimes, including terrorism. "I hope you will play a role of further enhancing Interpol's status by strengthening the cooperation between different countries to more effectively counter international crimes and terrorism," he said. "The (Seoul) government too will work together with Interpol to expand its cooperation with Interpol," he added.